Committed to providing the exact material needed for product designs, CMS has several in-house capabilities to customize materials for customer’s applications. 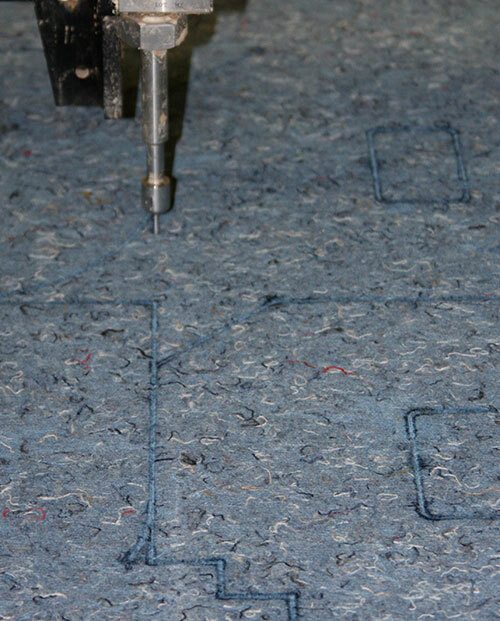 The post processing department has a CNC water jet cutter, flat bed die cutter, slitter, and other additional equipment that is used to finish products quickly and cost-effectively. CMS also offers contract packaging and fulfillment. A quality driven and IS0-9001 certified company, CMS would be happy to discuss your new or existing product needs. Please click here to let us know how we can help you in 2019. Custom Water Jet Cutting: CMS has the capability to waterjet cut specific designs for parts and panels. The 5’ x 10’, dual-head system is rated at 60,000 PSI and can take designs from PPAP right into full-production. .DXF formatted files are preferred. In-line Lamination: Scrims, foils, fabrics, and other coverings can be laminated to materials in-line by CMS. This value-added option is readily available for continuous, non-print registered applications where the customer is looking to reduce costs by eliminating off-line laminating processes. Die Cutting: CMS’s latest equipment addition is a large bed 50” x 61” die cutting press. This fully-automated HMI controlled die cutting press is ready to take-on high volume applications in thicknesses up to 5.5”. With continuous, roll-fed CNC capability we can guarantee optimum finished part yield to ensure that you always receive the lowest total cost per part. Sanding: CMS offers custom sanding of our products to fit your exact specified thickness tolerances. Sanding allows CMS to meet or exceed thickness tolerances that are important for your most technical projects. Contract Packaging & Fulfillment: CMS also has the ability to offer contract packaging of customers parts in customer specified and designed packaging that allows CMS to ship products directly to our customer’s end user. This helps customers save money and cost by eliminating shipping and storage to their facility. CMS’s Partners: CMS has great relationships with several partner companies to provide add on services to our customers including molding, 3D waterjet cutting, coatings, film wrapping of products, and logistical services from full truck loads to expedited nationwide shipping.